It’s as much of a challenge not to think of any heist movie you’ve ever watched while watching “Heist” as it is not to think of the movie “Speed”. 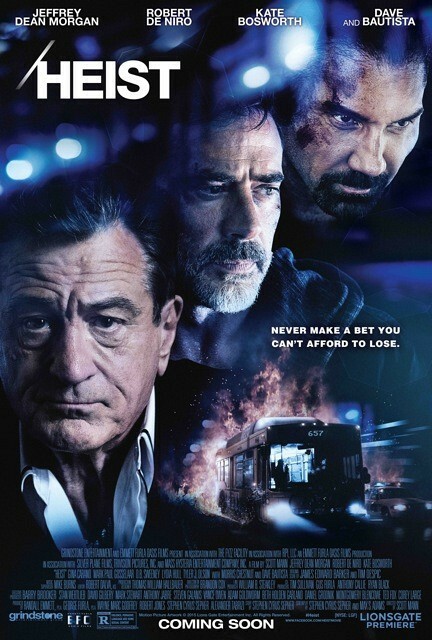 This crime thriller/pseudo family drama, is filled with familiar characters and plotlines of the heist subgenre and revolves around a hijacked bus. It may not have to maintain a certain speed limit, but most of the action takes place while in transit. 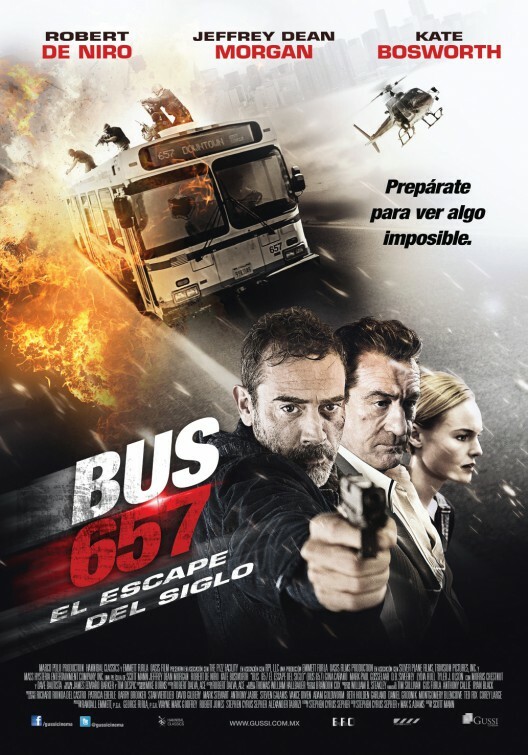 At one point, it was called “Bus 657”, that’s how prominent the vehicle plays in the film, but eventually it wound up with the generic title “Heist”, making it one of may heist movies released this year. There are many thoughts that linger after watching this sophomore effort from British director Scott Mann and screenwriter/actor Stephen Cyrus Sepher, but chief among them is how there is obvious talent present in this subpar movie and yet as talented as they are, movies like this serve to remind us that they have to earn a paycheck just like you and me. It’s baffling to consider though when Robert De Niro is involved in such a movie. Although as much as he’s delivered some really good work in recent David O. Russell films and the underrated “Being Flynn”, he’s also been known to take crap projects, be they lame comedies or weak thrillers. Some of them – like the barely seen 2012 thriller, “Freelancers” and last year’s “The Bag Man” – don’t even make it to theaters (well, maybe one – in the suburbs) and are relegated to iTunes, Amazon and VOD. One can’t help but to think maybe bankruptcy or alimony were motivations for taking roles in movies that are clearly beneath the award-winning actor/producer/director. Who knows how exactly what motivates De Niro to choose his projects, but “Heist” will never be included in any kind of retrospective career highlight reel. De Niro plays Frank “The Pope” Silva, a mob kingpin who runs a river casino named The Swan, which provides illegal activity and good times for local Chinese mafia. It’s unclear where exactly it’s located. Initially, I assumed the Southwest, but then I saw way too many causeways and rivers – so I thought it must be Louisiana, since so many movies have filmed there since Katrina. Upon some digging, I found that the movie was shot in and around Mobile, Alabama. Card-dealer Luke Vaughn (Jeffrey Dean Morgan) and relatively new bodyguard Cox (Dave Bautista) work The Swan, both aware of the shady dealings going on for years. Vaughn used to be Pope’s protegé and surrogate son, but walked away from the criminal activity to start a family. Now Vaughn has an ex-wife watching over their sick daughter in a hospital and Pope has a new protegé, Derrick “The Dog” Prince (Morris Chestnut), who dispenses employees and associates who haven’t followed Pope’s specific rules of business. One particular rule doesn’t allow him to be generous to Vaughn and offer him the $300,000 needed to pay for his sick daughter’s treatment. Vaughn asks as a personal favor, but Pope denies his request, maybe out of a personal grudge, but most likely because there’d be no movie if he was generous. Vaughn is desperate though, because his daughter is on a waiting list at the cold-hearted hospital and will be taken off of it by Friday. (NOTE: it’s unclear what day it is when we’re told this, so ‘Friday’ could be tomorrow, for all we know). Out of desperation, Vaughn teams up with the opportunistic (yet volatile) Cox, who’s noticed the suspicious comings and goings of dirty money related to the Chinese mafia (in Alabama? I dunno. No one has a Southern accent, anyways. So, anything goes) and figures Pope can’t report what they steal from the casino. When the duo attempt to rob their employer, nothing goes right – making this probably one of the worst thought-out heist I’ve ever seen on film. It proves that you should always know your partners before getting involved in a robbery with them and that Morgan’s Vaughn has never ever seen a heist film. It also proves that screenwriter Stephen Cyrus Sepher (who plays one of Cox’s pals) hasn’t either. He gives Vaughn a mysterious ex-military background and writes a pre-heist scene at a bar where Cox and his two pals meet up with Vaughn to go over the plan. Vaughn should’ve known right there and then that Cox and his company wouldn’t cut it – or at least, they’re far too inexperienced for the job. But then again, Vaughn’s motivation – getting money for his daughter’s treatment – puts him in a spot and impairs his judgement. He’s pressed for time and will do anything – with anyone – to meet her needs. Needless to say, Vaughn, Cox and one of his injured pals are forced to flee on foot when they realize their getaway drive freaked and fled (see? know who you’re robbing a joint with!) They hijack the nearest city bus (hence the former title “Bus 657”) being driven by D.B. Sweeney – which says “Downtown” on it , but don’t ask me which downtown – and take the passengers hostage. This all goes down at about 4am and there’s about a half dozen people on the bus. Now hold on a minute. Has this screenwriter every been on a city bus in the wee small hours of the morning? You not only will find a practically empty bus, but if anyone is riding, they will be some of the most bizarre and odd characters you’ll ever come across – or they’ll be asleep. Not in this movie. Here we have some of the same stereotypical hostage situation characters you’ve seen in any hostage crisis thriller. There’s two young blondes (one’s a veterinarian), token Asian kid, old black guy, pregnant woman, unbalanced guy with a knife who might try to be a hero and dude in a giant beaver mascot outfit. So, the typical 4am crowd on a city bus. If you’ve seen any hostage movie – or “Speed” – you know how these characters will play out. Officer Kris Bajos (Gina Carano) is nearby and begins pursuit in her squad car. She becomes the first to communicate with Vaughn and somehow senses he’s a decent guy – from his voice – “there was something about it,” she tells Det. Marconi (Mark-Paul Gosselaar). As the sun rises, the hijacking is all over the morning news and the police are getting antsy, while the partnership on the bus between Vaughn and Cox is becoming increasingly strained. With the authorities closing in as well as Pope’s maniacal right-hand Dog, Vaughn must decide how this is all going to play out with zero civilian casualties and still get the money back to the hospital for his daughter. There are a couple twists in “Heist” that you’ll pick up if you’re paying attention and following certain behavior on the bus. There are also some unintentional laughs such as flat line deliveries of awful dialogue and – well – Jeffrey Dean Morgan singing “Wheels of the Bus”, while on bus 657. So, you can cross that off your bucket list. Actually, Morgan provides the only believable and interesting performance here, everyone else is either flat, bland or phoning it in. 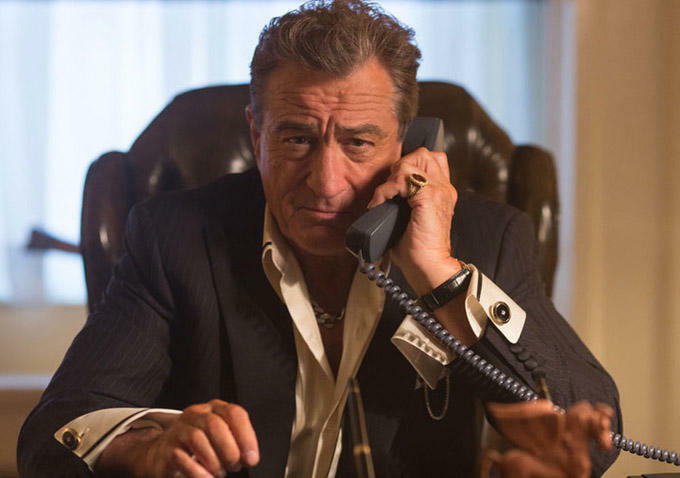 “Heist” also has not one, but two tired subplots for De Niro’s Pope. One has him hunting down his estranged daughter, Sydney (a cameo from Kate Bosworth), to make some kind of amends for being a criminal daddy and the other is when he reveals to her that he’s dying. So, he wants to make things right between them because he really wants to or because he’s dying? Too clichéd for me to care. Emmett/Furla/Oasis Films is the film company distributing “Heist” and although they’ve had some notable releases (“End of Watch“, “2 Guns” and “Lone Survivor“), but are also responsible for some tragedies in the industry. They’re the ones who’ve given Bruce Willis a non-theatrical movie career and they’ve also continuously tried to shove Curtis “50 Cent” Jackson in front of cameras as an actor. They’ve become the place where former pro wrestlers and rappers go for acting school apparently and where actors like De Niro can earn a few extra bucks. If you wanna catch a unique and intriguing heist movie, catch the recent German film, “Veronica“. Ultimately, this insignificant mashup of “Speed” and “John Q” qualifies as barely tolerable Netflix viewing to take in while folding laundry.